"pls read my note in my profee"
hello.mιι name is gabrielle nicole jaro.you can call mєє nicole for short :)).im ____ years young.Currently living in the Philippines.Im good in keeping secrets ^^.I super duper love Taylor Swift and Chowder :).For me anime is cute ,,Special A,Naruto,Fruit Basket,Lucky Star,Bokura ga ita are my favorite in anime .I very love kawaii,enakei,colors,cats,ice cream,shoes//sandals,scene && my friends! !.I hate da peoples who are mean,copycats,liars,plastics..so i wish yuur not like that :))understand?.I have my best friends here in GG ..dis persons are found in my lovers list ..i very l♥ve them ..if yuu wanna know bout me .. just ask ! && here my friendster acc. 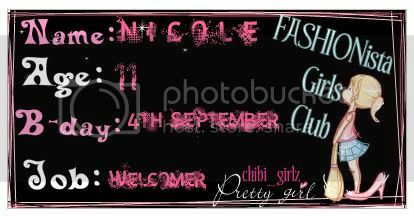 Login or register to add ♥♥ NiiCOLE <33 as your friend!